Our grandson came for a visit to sample the corn harvest from our little garden. He is old enough to know time between seeding and harvesting is lengthy. To reap the harvest we first plant the seed. 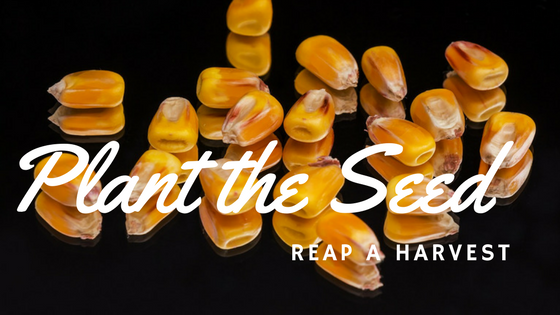 “Why can’t you plant a seed one day and eat corn the next,” he questioned as buttery juice oozed from the corners of his mouth. I have asked God for specific things on many occasions. Often what he offers looks quite different from my requests. I expect the finished product; He gives me the seed of a promise. Seeds never look like the plant that brings the increase. Each is God’s seed of opportunity, ability or gifting; each must be planted into a bed of faith to produce. “The LORD would speak to Moses face to face, as one speaks to a friend. Joshua was given a seed of God’s presence. He stayed in it – resting and waiting there. Then later when it was his turn to lead, success was given to him. Success was the harvest of time in God’s presence. His success became the victory of an entire nation. “Don’t ask me to leave you and turn back. Ruth’s dedication to care for her vulnerable mother-in-law was a seed that wove through the genealogy of Jesus Christ. Through her the Saviour of the world would come. Her commitment to the God of Naomi became the forerunner of millions of others who would come to Christ. God’s grace is so incredible that even our greatest failures can become seed for propelling us into success! We know the end of the story. Peter became the apostle to the Jews, sharing the truth of gospel far and near. The seed of failure could have destroyed him! He chose to plant it deep in the soil of faith. There are many with great intelligence, talent and gifting, with overflowing resources and opportunities with ability to excel in many levels. Yet they have become shipwrecked or stalled out in their faith. Why? Every one of these qualities is a gift, or seed, God bestows. Over the years, each of us are given many seeds. We might not even recognize them as God’s provision to the needs of ourselves or others. How devastating to reach the end of our journey and discover we too have been foolish! This poor man already had barns filled. When more seed came, he continued to store it. There is absolutely nothing wrong with abundance. Abundance is simply an overflow of God’s blessing. This poor man forgot the gift of seed was God’s. Like my grandson, savour the goodness of God’s blessing! At the same time be sure to plant the little seeds He gives. The harvest will be amazing!